Rocketdyne LOx/LH2 rocket engine. Used in the Saturn IVB stage in Saturn IB and Saturn V, and the Saturn II stage in the Saturn V. First flight 1966. Sea level versions with reduced expansion ratio were proposed for Saturn II first stage use. Upgraded toroidal aerospike versions (J-2T-200K and J-2T-250K) were developed for upgrades to Saturn upper stages. The modestly improved J-2S was tested and provided basis for X-33 linear aerospike engine thirty years later. After 30 years the J-2 was resurrected again for use in boosting NASA's new Orion manned capsule to orbit. In the event, NASA was unable to resist 'improving' the J-2S, and by early 2007 the engine for the second stage of the Ares 1 Crew Launch Vehicle was the redesignated and substantially different J-2X. Status: First flight 1966. Date: 1960. Number: 87 . Thrust: 1,033.10 kN (232,250 lbf). Unfuelled mass: 1,438 kg (3,170 lb). Specific impulse: 421 s. Specific impulse sea level: 200 s. Burn time: 475 s. Height: 3.38 m (11.08 ft). Diameter: 2.01 m (6.60 ft). The J-2 was a gas generator, pump-fed engine. Specific impulse and thrust is for final flight version; J-2 had a specific impulse of 418 sec/thrust of 90,700 kgf/mix ratio of 5.00 on LV's SA-201 through 203, and 419 sec/thrust of 102,040 kgf on SA-204 through 207 and SA-501 to 503. Sea level versions with reduced expansion ratio proposed for Saturn II first stage use. Upgraded toroidal aerospike versions (J-2T-200K and J-2T-250K) studies for upgrades to Saturn upper stages. Modestly improved J-2S was tested and provides basis for X-33 linear aerospike engine thirty years later. Proposed for use in Nova A-2; Saturn IVB; Nova NASA-3; Nova B-2; Saturn II; Jarvis-2; Saturn MS-II-1; Saturn S-II-8; Saturn S-IVC; Nova 60-8-3; Saturn S-II-C3; Saturn S-II-4; Saturn S-II. Saturn V S-ll & S-IVB Stage Engines, Saturn IB S-IVB. Upper Stage Engine. Thrust (sl): 486.200 kN (109,302 lbf). Thrust (sl): 49,577 kgf. Engine: 1,438 kg (3,170 lb). Chamber Pressure: 30.00 bar. Area Ratio: 28. Thrust to Weight Ratio: 73.1801112656467. Oxidizer to Fuel Ratio: 5.5. Coefficient of Thrust vacuum: 3.35409543547025. Coefficient of Thrust sea level: 2.42076210213692. J-2T-200K Rocketdyne LOx/LH2 rocket engine. Study 1965. Proposed for later versions of Saturn V. Toroidal aerospike plug nozzle version of J-2. 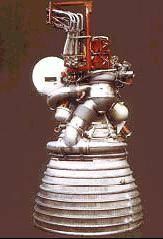 J-2S Rocketdyne LOx/LH2 rocket engine. Developed 1965-1969. J-2 version proposed for Saturn follow-on vehicles, using results of the J-2X technology program. The engine was simplified while offering improved performance. HG-3-SL Rocketdyne LOx/LH2 rocket engine. Study 1966. High-performance high-pressure chamber engine developed from the J-2, fitted with lower-expansion nozzle for sea level use on Saturn INT-17. Technology led to Space Shuttle Main Engines. J-2-SL Rocketdyne LOx/LH2 rocket engine. Study 1966. Sea level version of J-2 with reduced expansion ratio proposed for Saturn II first stage use. HG-3 Rocketdyne LOx/LH2 rocket engine. Study 1967. High-performance high-pressure chamber engine developed from J-2. Considered for upgrades to Saturn V launch vehicle upper stages. Technology led to Space Shuttle Main Engines. 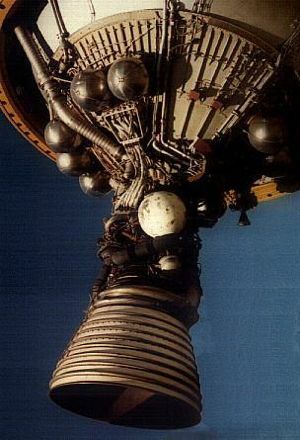 J-2T-250K Rocketdyne LOx/LH2 rocket engine. Study 1967. Proposed for later versions of Saturn V. Toroidal aerospike plug nozzle version of J-2. Aerospike Annular Booster Rocketdyne LOx/LH2 rocket engine. Aerospike Typical Annular Booster . Pressure-fed. Thrust from 50,000 to 250,000 lbs at altitude. Plug-Nozzle J-2 Rocketdyne LOx/LH2 rocket engine. Study 1993. Plug nozzle version of J-2 proposed for certain Saturn V upgrades in late 1960's. Used on DC-I launch vehicle. XRS-2200 Rocketdyne LOx/LH2 rocket engine. Development ended 1999. Linear aerospike engine for X-33 SSTO technology demonstrator. Based on J-2S engine developed for improved Saturn launch vehicles in the 1960's. IPD Rocketdyne LOx/LH2 rocket engine. Development ended 2006. Integrated Powerhead Demonstrator, end goal was flight-rated, full-flow, hydrogen-fueled, staged combustion rocket engine in the 1.1-million-newton thrust class. J-2X Rocketdyne LOx/LH2 rocket engine. Ares I launch vehicle second stage. In development 2006-2016. Began as an update to the J-2 engine of the 1960s, but final design was all-new, 20% more thrust, but double the weight. RS-2100 Rocketdyne LOx/LH2 rocket engine. Next Generation Launch Vehicle Booster. Full flow staged combustion, pump-fed. Thrust and specific impulse values are at sea level. RS-2200 Rocketdyne LOx/LH2 rocket engine. Development cancelled 1999. Linear Aerospike Engine developed for use on the Lockheed Reusable Launch Vehicle, the production follow-on to the X-33. Country: USA. Spacecraft: NASA Mars Flyby 1965. Launch Vehicles: Saturn C-2, Nova NASA, Nova B, Nova C, Nova 8L Mod, Nova D, Nova 9L, Nova 4S, Nova 5S, Nova 7S, Saturn C-4, Nova A, Saturn C-3, Saturn C-5, Saturn C-3B, Saturn C-4B, Saturn C-3BN, Saturn C-5N, Nova 8L, Saturn C-8, Saturn IB, Nova GD-B, Saturn IB-A, Jarvis launch vehicle. Propellants: Lox/LH2. Stages: Jarvis-2, Saturn II, SLS Stage A, Astro-2, SLS Stage B, Nova NASA-3, Nova 4 J-2, Nova 60-8-3, Nova 9L-3, Nova 9L-4, Nova A-2, Nova B-2, Saturn IVB, Saturn S-II, Saturn S-II-4, Saturn S-II-8, Saturn S-II-C3, Saturn II C-5A, Saturn IVB C-3B, Saturn IVB C-5A, Saturn S-IVC, Nova GD-B-2, Saturn IVB-A, Saturn MS-II-1, Saturn MS-IVB-1, Saturn MS-IVB-x, Saturn MS-II-1A, Saturn IVB (S-IB), Saturn MS-IVB-1A, Saturn MS-IVB-4(S)B, Saturn IVB (S-V), Saturn MS-II-4(S)B. Agency: Rocketdyne. Bibliography: 225.